Greenleaf Book Group Press, 9781626342422, 216pp. In this informative and accessible book, Morag Barrett shares exceptional knowledge on why a business plan and the newest product mean nothing if you don t have your people aligned to execute the plan. Leaders rarely fail because of lack of technical ability, but do so because they don t cultivate effective working relationships. The people skills, the so-called soft skills, are what get the hard goods delivered. Employees may join organizations because of the brand or the benefits, but they invariably choose to leave because of poor relationships. With pragmatic models and examples, Barrett shows us the four relationship behaviors and their dynamics that are at work in companies and in life. 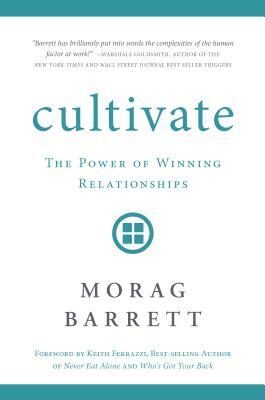 High-level, smart information abounds in "Cultivate," but so, too, does Barrett's generous outlook and philosophy. You will learn to identify Allies, Supporters, Rivals, and Adversaries, and how to turn Adversaries into Supporters and Supporters into Allies. Reflect on your talents and strengths. Be proud of them. When you are having a bad day (and we all do), this is the time to return to these anchors, to remind ourselves that moments of weakness, moments of missed expectations, are just that moments. Be an Ally to yourself. The relationship lessons you ll learn in "Cultivate" will stay with you long after you ve finished the book. Morag s experience ranges from senior executive coaching, to developing high impact teams, to leadership development programs across Europe, America, and Asia. She is a sought-after speaker, trainer, and the founder of SkyeTeam. With 25 years experience in industries around the globe, Morag understands the challenges of running a business and managing people. Morag has established herself very happily in Broomfield, Colorado, with her husband and three sons. For fun, in addition to time with her family, you ll find Morag playing in the Broomfield Symphony Orchestra, where she is the principal bassoonist."